Who else but me would combine Spanish and French desserts into one tasty treat. Ever since I made my Conversation Heart Macarons, I have been thinking up other crazy macaron flavors. With Cinco de Mayo around the corner, I thought a churro flavor would be appropriate. I've made Churro Cupcakes, Churro Crepes, Churro Donuts, Churro Puff Pastry, so why not in a French macaron form. Trust me, you are going to like these. There are really not a lot of ingredients for these macarons, but they do take a bit of time and patience to make. You have to measure, sift, whip, and let sit 30 minutes before you even put them in the oven. They are not an everyday treat, but are great for special occasions. They can be made ahead of time and kept in the fridge. Even though it has cinnamon on the inside, I wanted the macaron to have a coat of cinnamon sugar on the outside. To adhere the sugar, I used a simple glaze. For the filling I was going to do just dulce de leche, but it was a little to rich for me, so I had to come up with another idea. I found a recipe for dulce de leche buttercream that worked out well. It is so good, I just wanted to eat it with a spoon. Of course that wasn't enough. I still wanted the taste of pure dulce de leche in the macaron so I first added a thin coat of dulce de leche, then topped it with some buttercream before smooshing the two macarons together. Now I know at this point all you want to do is eat one, but again you have to wait. These Churro Macarons need to sit in the fridge at least 24 hours to acquire their delicious flavor. I tried one on the day I made them and they were a bit hard, but by day 2-3 they were just right. The shell was crunchy and full of cinnamon sugar flavor. The inside of the shell was soft and chewy and the filling was amazing. I will say they are on the sweet side, but these are to be savored not chowed down like a pack of cookies. These are perfect with a cup of coffee, espresso, or cappuccino. Each bite is to be eaten slowly and enjoyed thoroughly. I just ate another one while writing this post and it still tastes phenomenal on day 5. These macarons were totally worth the effort. Prepare circle templates (1 1/2 inch circle, 1/2 inch apart) and line baking sheets with parchment paper, placing template under parchment. In a food processor, pulse 1/3 of the powdered sugar and all the almond flour to form a fine powder. Then sift sugar mixture 2 times. Sift remaining powdered sugar 2 times also. In a large bowl combine almond flour mixture, remaining powdered sugar and cinnamon. Add egg whites to stand mixer bowl with whisk attachment. Whisk whites on medium speed until foamy. Then gradually add the granulated sugar. Once all sugar is added, scrape down the sides of the bowl. Increase mixer speed to high and whisking until stiff, firm, glossy peaks form. Next sift the powdered sugar mixture 1/3 at a time over the egg white mixture and carefully fold using a large silicone spatula until mixture is smooth and shiny. Repeat process for the remaining 2/3 of the powdered sugar mixture. Place the macaron mixture into a piping bag with a round tip ( I used Ateco # 804). With piping tip 1/2 inch above the template , pipe 1 1/2 inch circles onto parchment paper lined baking sheets. Once finished gently tap baking sheet on your work surface to release and air bubbles and help form the "feet" of the macarons. When ready, bake the macarons at 375°F for 10-13 minutes (Keep an eye on them so they don't burn). Rotate baking sheets halfway through to promote consistent baking. Macarons will be ready when they are crisp and firm. Remove from oven and let cool for 2-3 minutes. Then carefully remove the macarons from parchment paper and place on a wire rack to cool completely. In a small bowl, whisk together the powdered sugar and milk to a thin spreadable consistency. 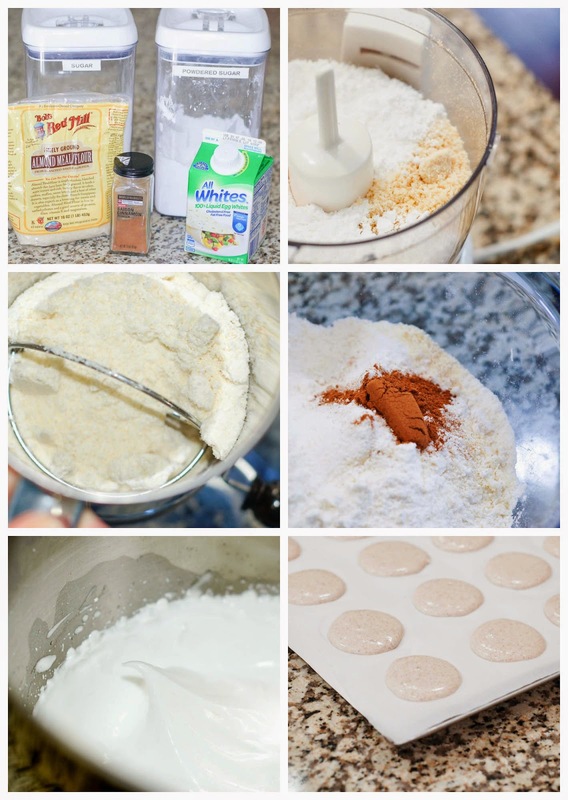 Brush the tops of each macaron with a light coat of glaze and sprinkle with about an 1/8 teaspoon or less of cinnamon sugar each. Set aside and let the glaze dry. In a stand mixer, beat the butter until fluffy. Add the powdered sugar and salt and mix until well combined. Then add 1/4 cup dulce de leche and mix until fully incorporated. Place the mixture in a piping bag or Ziplock bag with the tip cut off. 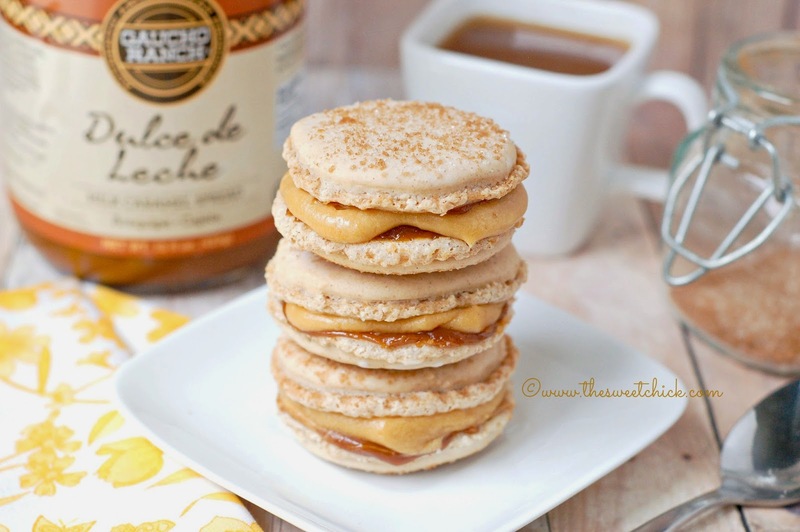 Using the remaining dulce de leche, spread on thin layer (about a teaspoon or less) on half the macarons. Then over that, pipe on a bit of the dulce de leche buttercream. Place the remaining macarons over the filled ones and carefully sandwich together. Macarons can be kept sealed in an airtight container up to 1 week in the fridge. McCormicks does sell a premade cinnamon sugar mix, but if you want to make your own, you can find my recipe here. 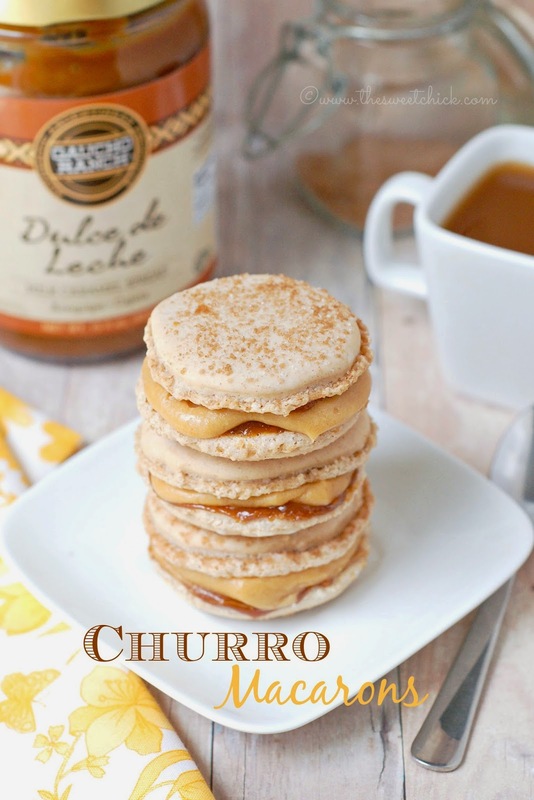 For the dulce de leche, I used Gaucho Ranch brand that I found at World Market. I like it because it is thick. 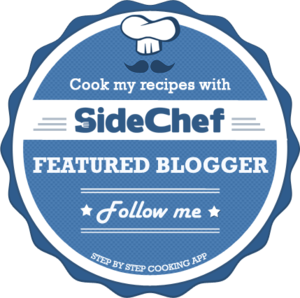 This recipe may be shared at these fabulous link parties. These look delicious! I love the filling, and I love that they still taste great after five days! They just kept getting better. Wow those look great! I really need to work on my macaron skills. Thanks. I am still practicing with the macarons. My first batch didn't work and I burnt part of another batch. I just kept on trying till I got it right. Practice makes perfect Marci. Just try! 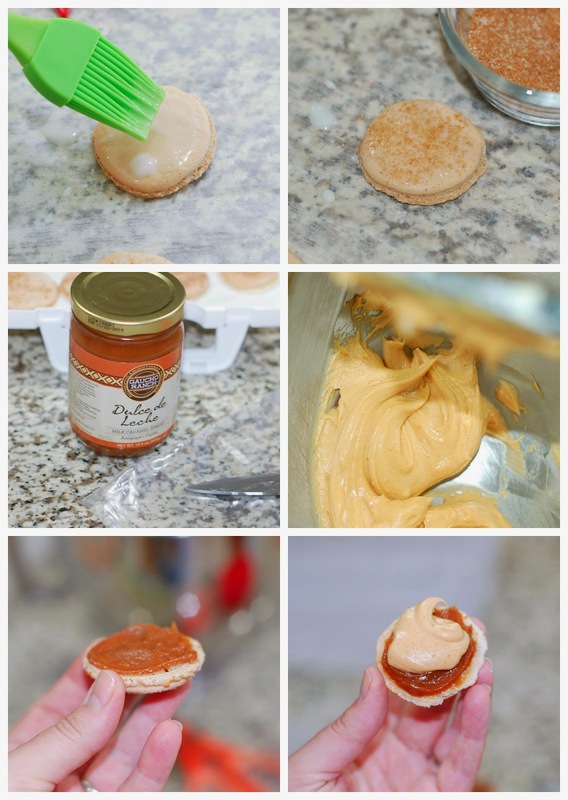 I seriously have to try these! I've had macarons on my to do list for a long time and already have the almond flour in my pantry but every time I work up the nerve to do them I chicken out. You make them look so easy. I will do them soon. I hope :). Thanks for linking up. I appreciate it. Oh I stress out every time I want to make them. My first batch usually doesn't come out as good as my second batch. Luckily I have a lot of nice neighbors that eat the defective ones. Oh My WORD! These look so yummy. I have to confess that macarons have been on my bucket list for a long long time...they scare me! Thank you so much for linking up at Party in Your PJs...we love parting with your! Thanks Kim. These are only the second kind I have tried to make. I am still new at it. Macarons are one of my favorite thing to bake. I loved it especially with peanut butter.